It’s not uncommon that members email me prior to starting the 21-Day Challenge to tell me a bit about themselves. Although I’m not insensitive to what they’ve gone through, I can quickly see how some women define themselves by their struggles. In our program, we call this ‘false identities’. Whether it’s your age, your weight, your health status or your life’s circumstances, refuse to let your ‘false identities’ define you. You are so much more than your past, your circumstances, or who the world has labeled you to be. That was my response whenever someone asked me to tell a bit about myself. It was my way of bringing people into my struggle. I had so much identified myself with my circumstances, that I felt that I need to let everyone know that I was somehow damaged because of my situation. Being a single mother became my false identity. It gave me a reason why I would not be successful. It gave me an excuse as to why I could not afford to buy certain things; why I could not participate in certain activities; or why I could not spare the time to go places. Over time, the false identities we give ourselves become survival tools that we use so we can disqualify ourselves (before someone else does it), or give ourselves a handicap so people can lower their expectations because of what we’ve been through. It gives us an excuse for why we will not be successful. Imagine how people would react to that kind of introduction! People would suddenly stand up and pay attention to you. People would stop dismissing you, and most importantly, you would stop dismissing yourself! God continually teaches us that our standards are not His standards. His perspective is very different from ours. As God sends the prophet Samuel out to choose a new king, we see this principle at work. God did not say, I’ll take the ruddy one who tends sheep, as he referred to David. He knew his potential. He knew his future, just as He knows yours! What’s your story that you’re constantly repeating? Maybe it’s your weight, your fibromyalgia, your disability, your age, your poor self-esteem, your slow metabolism, your abuse. Beloved, it’s not who you are. It does not, and should not define you. It’s not the reason why you can’t achieve all that God has for you. It’s not why you can’t lose weight. God wants to do something new in your life, regardless of who you believe you are or are not. The next time you feel the need to share your false identity with others . . .
1. Stop and take notice of how you’re defining yourself. 2. Remind yourself of who God says you are. 3. Choose a scripture that you will use every time you find yourself repeating your ‘story’ or false identity. I would love to hear some of your scriptures or declarations. Please share yours below. P.S. 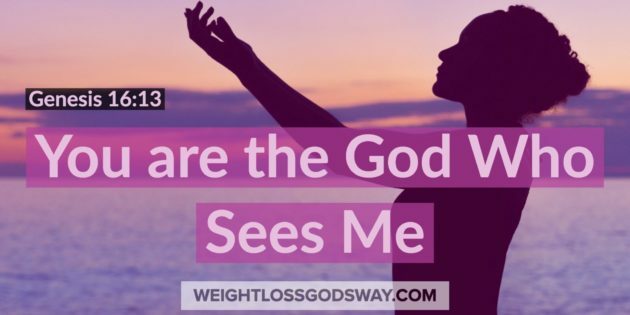 If you want to know how to identify and change your false identity, sign up to become a Weight Loss, God’s Way Monthly Member. It will give you insight into why you keep veering in that direction when you’re trying to lose weight and give you a clear roadmap for how to achieve health and successful weight loss, God’s Way. Hi I’m Vanessa. I’m beautifulky and wonderfully made. I’m victorious, blessed and prosperous.